If you are in Bristol this evening make sure you head over to Workshop. 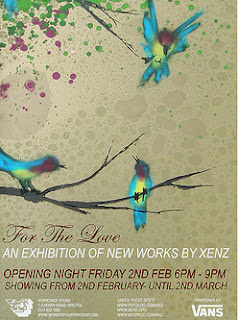 Tonight will see them present an exhibition by the Bristol Street Artist known as XENZ. His is a tag developed in the early 90s, it means “sense” pronounced zenz. He began painting graffiti style in the late 80s experimenting with spray-paint to create atmosphere and depth by building layers and layers of lines and dots mixing the disciplines from letterform and also character painting to create a pictoral letter style. Workshop, 1-2 Perry Road, Bristol.